Contains push along car, bath boat and 8 figures. Batteries required…. Ahoy there mates! Join Peppa and George on their Grandpa’s boat and sail the high seas. Comes with re-moveable exclusive dressed Peppa, George and Grandpa figures. Includes a set of bath crayons for extra play. Specially designed to float in water for great bath time fun! Comes with re-moveable exclusive dressed Peppa. Includes bath crayons; Floats in water; Includes George and Grandpa figures; Size H22, W34.5, D17cm; For ages 3 years and over. EAN: 5029736026936 WARNING(S): Not suitable for children under 3 years old. To be used under the direct supervision of an adult. Only to be used in water where the child is within its depth and under adult supervision. This product contains Small parts Choking Hazard. * 3973237 19.97. Children will love bathtime with the Peppa Pig Bathtime Boat! 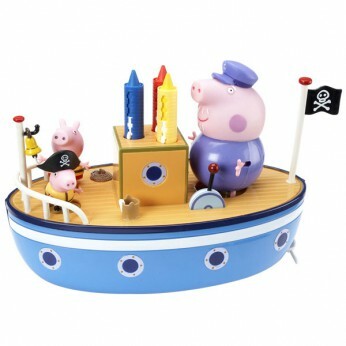 Take Peppa Pig, George Pig and Grandpa Pig sailing across your bath! Comes complete with removable Peppa Pig and George Pig figures dressed in their life jackets ready for their water adventures and 3 different coloured bath crayons. This toy costs approximately £19.99 (for the latest and best prices make sure you check our retailer list for the Peppa Pig Bathtime Boat above). In our review of Peppa Pig Bathtime Boat we classed it as being suitable for ages 3 years, 4 years, 5 years but recommend you check the manufacturer specific advice before purchasing.